Tiger DC-4 on the Ramp. This is the amazing story of a DC-4 that ditched in the Pacific Ocean. The Aircraft was owned and operated by Flying Tiger Inc. What is interesting in this story is how the complex fuel management system on board the DC-4 basically caused the accident. I've always liked Flying Tiger, actually flew on one of their big DC-8-62's From McChord AFB Washington to South Vietnam over the blue Pacific. Anyway here is the story. 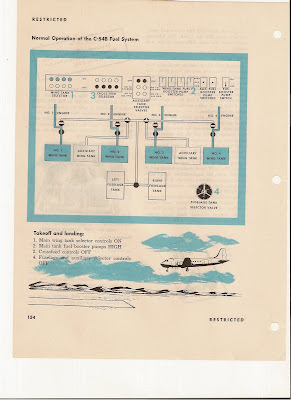 I used the actual investigation from the CAB report and info from a story about the crash published in Saga Magazine and also segemsnts taken from a C-54/DC-4 operating manual to explain the complex system. The crew of Flying Tiger Flight 7413-23 9 (Tiger 433) met in flight operations at Travis Air Force Base California early in the morning on September 24, 1955. The flight was a cargo flight loaded with 15,330 lbs. of cargo, (jet engines) destined for Tokyo, Japan. 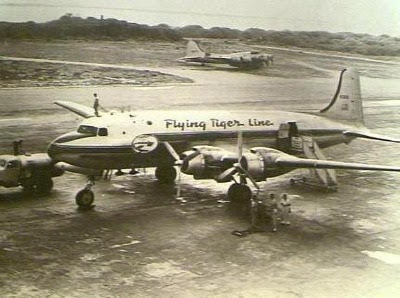 The aircraft was a Douglas DC-4, serial number 10410, owned and operated by Flying Tiger Line inc. The aircraft was manufactured on September 23, 1940, and had a total of 25,590. 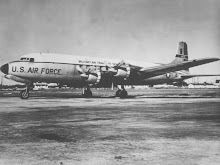 The aircraft was equipped with Pratt And Whitney R-2000-7N2 with Hamilton Standard model 23850 propellers. Flying Tiger owned the aircraft on January 14, 1955. The total time of the engines varied between 6,037 and 11,428 hours. The crew consisted of Captain A. J. Machado, First Officer W.F. Gin, Co-pilot R. C. Hightower, and Navigators R.C. Olsen and D. Ventresca. The trip departed Travis at 0958 and arrived at Honolulu at 2211. The aircraft was refueled, at Honolulu to 3,016 gallons for the flight to Wake Island the next scheduled refueling stop. There was no off loading in Honolulu. G/W@T/O..72,993 Actual T/O weight at Honolulu. The aircraft departed Honolulu @ 0013, September 24, 1955. On an IFR flight plan to Wake Island Airport. The filed route was Green 9, Rhumbline track, to maintain 8,000 feet. The dispatchers informed the crew that the weather they would encounter along the route consisted of a low pressure trough that they would cross at the 165 degrees of west longitude. There were no fronts to be crossed enroute. Scattered cumulus clouds would prevail on most of the route with tops extending to 12,000 feet. The take off from Honolulu was uneventful. First Officer Warren Fong Gin who had 7.603 total flying hours with only 360 in the DC-4 seated on the left made the takeoff. Captain Anthony J. Machado, was seated in the right seat, Captain Machado a very experienced pilot held ratings in DC-3/4/6 and C-46 aircraft he had a total of 13,450 hours of which 8,895 were in the DC-4. Co-pilot Robert Carl Hightower who had a total of 1,328 hours with only 20 of those hours in the DC-4 was seated on the jump seat between the pilots. The aircraft took off with all main tanks full of fuel, (total of 1,942 in the mains). The fuel management was set up so that the four main tanks supplied fuel to their respective engines. Also at takeoff the two outboard aux tanks were full (412 gallons each) and the two inboard aux tanks contained 130 gallons each. The inboard tanks had a capacity of 362 gallons each. In cockpit behind the three pilots were the navigators Dominic Ventesca and Richard Carl Olsen. Olsen was Chief Navigator and Radio Officer for Flying Tiger line. The navigators were responsible for giving the Captain Machado while flying the route to Honolulu Tiger 433’s navigators gave hourly position reports to Honolulu ATC, the reports consisted of current Position, fuel remaining, ETA next Position and a weather report. About one hour 0115 into the flight Captain Machado retired to a crew bunk to rest. Co-pilot Hightower took his seat which left first Officer Gin in charge. The Control Pedestal on the DC-4, Showing Fuel selector levers. The cruise control plan established by the crew required that when the main tanks were down to 400 gallons, Gin was too put No. 1 and No.2 engines on No. 2 auxiliary tank and engines 3 and 4 on No. 3 auxiliary tank with the crossfeed control positioned to each pair of engines. This required that when the fuel in the inboard aux tanks (no. 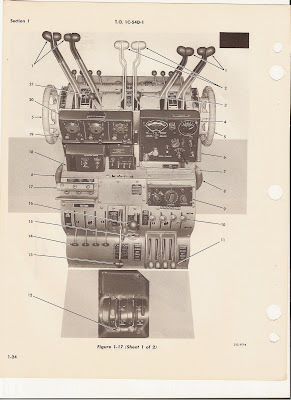 2@3 ) was down to around 20 gallons in each tank, the fuel selectors were positioned to the outboard aux tanks (no 1@4). When Captain Machado returned to the flight deck after about five hours of rest this was the position the fuel selectors were in. He immediately took the left hand seat. First Officer Gin moved over the right seat relieving Hightower. At this time according to the crew there were 40 gallons in No. 1 aux tank supplying No. 1 and 2 engines, and 100 gallons in No. 4 aux tank supplying No. 3 and 4 engines. No. 2 and 3 aux tanks were empty because First Officer Gin had positioned selectors to transfer the remaining fuel) 20 gallons each) in the inboard aux tanks after switching from the outboard aux tanks. At 0630 Tiger 433 was transferred to Wake Island ARTC for the remainder of the flight. Approximately ten minutes after Captain Machado (0633) returned to the flight deck, No. 1 engine sputtered and quit, its fuel pressure dropped to zero. The captain immediately moved the No. 2 and 3 fuel selectors from off to full forward position, the other aux selectors were already in the full forward position. MISTAKENLY THINKING THIS IS THE POSITION FOR THE MAIN TANKS. He also shut off the crossfeeds. Then the No. 3 engine sputtered and quit and its fuel pressure dropped to zero. 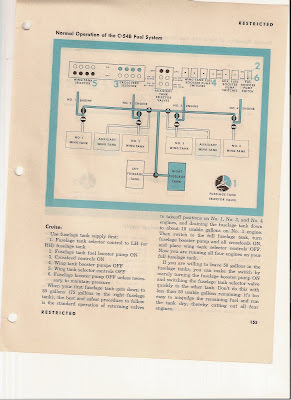 Captain Machado realized his error and immediately pulled all four selectors to the center or main tank position and moved the four mixture controls to the auto rich position. During the emergency No. 2 engine also quit and its fuel pressure gauge read zero. Each fuel selector was checked for main tank position, they were found to be so positioned with crossfeeds off and main boost pumps on. The Captain then moved the crossfeed controls to the “All engines to Crossfeed” position which resulted in the fuel pressure of No. 4 engine fluctuating. Quickly the crossfeed valves were then shut off and No. 4 engine became stabilized. At this time the No. 1, 2 and 3 props continued to windmill with their respective selectors on the main tanks, main boost pumps and crossfeeds off. Captain Machado held them in this condition for a time period he thought would be sufficient for restarting the engines. Unfortunately the engines did not restart and their fuel pressures remained at Zero. Captain Machado had no alternative but to feather the No. 1, 2 and 3 props, and put the No. 4 engine at full power. Three minutes later at 0633 Tiger 433 reported to Wake ARTC they were declaring an emergency, they advised Wake that they had lost three engines and were unable to return to Honolulu. With the loss of three engines the aircraft began to descend. It was descending at airspeed of 135-140 knots. Engines No. 1 and No. 2 were unfeathered and separate attempts were made by the Captain to restart the, both attempts failed. The crew had no option but to refeather the engines and try to start No. 3 engine. During the descent the captain ordered the men into their life vests. On the flight deck Captain Machado and First Officer Gin and Co-pilot Hightower standing between them were struggling to get an engine started. During this rapid descent Navigator Ventresca went into in the cargo compartment and was trying to unlash and release the bulky cargo. Olsen was seated at the radio sending SOS and mayday reports to Wake, at a thousand feet above the ocean he clamped down his key so that a continues signal would be sent Olsen then took a position behind Gin’s seat and braced himself for the impact. Ventresca reported he was at the back of the aircraft braced against a bulk head. Hightower went back and seated himself in the radio operators seat. But in the attempt to start the engines the aircraft struck the water in a slightly nose high attitude. Finally around 500 feet Captain Machado took the controls and banked the aircraft so as to follow the rough swells that he could see on the dark ocean and brought the aircraft down. The impact was at first not to bad but then a hard crashing jolt hit the aircraft. Captain Machado hit his head on the instrument panel and was knocked out. The cold sea water rushing into the aircraft woke the Captain. On the second impact the cargo broke loose and moving rapidly forward trapped First Officer Gin and Hightower, who was sitting in the radio operator’s seat. After the aircraft came to a stop Navigator Olsen opened the astrodome and Captain Machado desperately attempted to help the two trapped crew men from their seats. In a struggle the four men left the aircraft through the astrodome. The men floated in the sea looking at the aircraft rising and falling in the swells. Realizing the Ventresca was in the cargo compartment Captain Machado made his way back to the stabilizer and on the fuselage above the cargo door tried to open it but could would not open. He called to Ventresca to open the door from the inside, but Ventresca said he could not see and wanted to know which way to go. Unfortunately the men on the outside could not open the crew door and Navigator Ventresca who was still in the cargo compartment was trapped and sank with the aircraft. Three of the crew had on their life jackets, Captain Machado could not locate his jacket. The men went into the water as the aircraft sank. Captain Machado had no life jacket until First Officer Gin and Navigator Olsen both died in the water during the more than 30 hours they were awaiting rescue. Captain Machado and Co-pilot Hightower both survived this horrendous ordeal suffering from impact injuries and shark bites during their hours in the water. The amazing story of their survival while floating the ocean among sharks and heavy weather for over 30 hours was written in an Article by Edward Perry Stafford entitled “The Tigers and the Sharks”.in the August 1964 issue. Flying Tigers DC-4’s operated with a fuel system that included a 6 tank configuration and a 8 tank configuration which had different fuel selector positions. The Fuel selector positions on the 6 tank system were REAR-OFF; CENTER-AUXILIARY TANKS; FORWARD-MAIN TANKS. The DC-4 8 tank positions for the fuel selectors are: REAR-OFF;CENTER-MAIN TANKS; FORWARD-AUXILIARY TANKS. According to records Captain Machado had piloted both types of the fuel selector DC-4 aircraft. 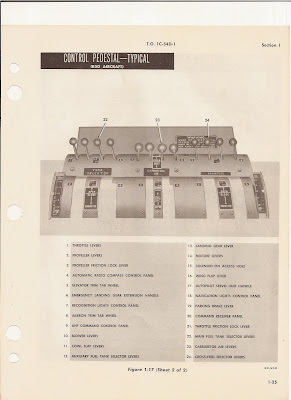 All pilot crewmembers were all checked out on these systems on the DC-4. During the investigation flight tests were made on November 8. 1955 at the request of the Board and were observed by CAB personnel. The tests were conducted in a DC-4 equipped with the 8 tank system as installed on N90433. All possible reactions to the positioning of the control positions that Captain Machado listed in his report, including those before and those after he “Realized his mistake” in his first positioning of the fuel tank selectors. The flight tests proved conclusively that if No. 1, 2, and 3 props had been allowed to windmill with fuel system and engine controls in the configurations described by Captain Machado, the engines would have restarted. 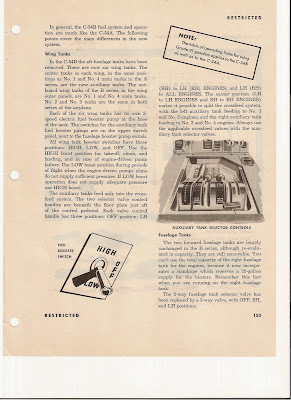 The conditions described in the Captain’s report were: Ignition on; fuel selectors positioned on the main tanks for each respective engine; main tank boosts on; mixture auto rich; crossfeeds off. While feathering the three propellers would slow the rate of descent the action definitely removed any possibility of restarting the engines while in that condition. The separate unfeathering of the propellers and the starting attempts probably consumed more time and altitude than the original feathering may have gained. It is evident that if the remaining fuel (20 gallons each) in Nos 2 and 3 aux tanks had not been transferred by First Officer Gin, the loss of power would not have occurred when it did even though Nos 2 and 3 fuel selectors were incorrectly positioned for an indefinite period after the loss of power on the three engines. If the fuel transfer had not been made, the additional normal flight time would have allowed the captain to make a thorough survey of the fuel situation and then an unhurried routine switching of each main tank to its respective engine. 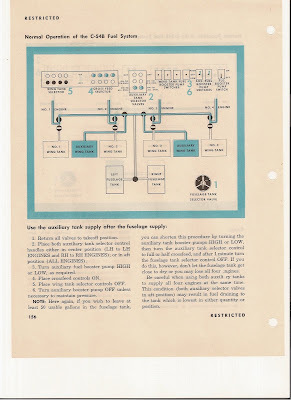 According to six hourly radio reports from the flight prior to the emergency, fuel consumption had been a uniform 200 gallons per hour for the four engines. Each main tank contained 400 gallons at the time of Captain Machado's return to the flight deck, according to his statement, and this amount of fuel was sufficient for approximately eight hours of flight. The flight tests also showed that even though the fuel transfer was made and the three engines subsequently stopped. there was more than sufficient time from the altitude of 8,000 feet to restart the engines. 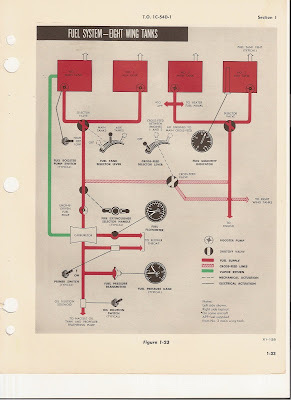 The practice employed by the crew in allowing two engines to be operated on one auxiliary tank down to 20 gallons of fuel is considered poor operating practice. By reason of the positive results obtained in the flight tests, the Board concludes that the captain's and copilot's recollection of events occurring after the loss of power, as described in their statements, was incorrect an to action and/or sequence. This absence of accurate recollection is understandable when consideration is given to the stress of the emergency and subsequent events after the ditching and before rescue. The carrier, the aircraft, and the crew were currently certificated. According to company records., the load was within specified limits and properly distributed. Weather or navigation was not a factor in the accident. There was sufficient fuel aboard the aircraft to reach the destination. Loss of power was experienced in three engines because of the positioning of fuel selectors on empty or nearly empty tanks. The failure to restart the three engines was due to incorrect technique or improper method of using fuel selectors end associated controls. The Board determines that the probable cause of the accident was the loss of power in three engines due to incorrect fuel system management and faulty restarting methods which resulted in the ditching of the aircraft. I knew Mr Hightower. Our families were close for a time and he and my Dad had an aircraft restoration/supply business for a while on the side apart from their regular aviation jobs. He retired a Senior Captain flying L-1011s for Delta (sometime in the 1980s I believe). First officer Gin was my Uncle i was only 3yrs old at the time of his death.